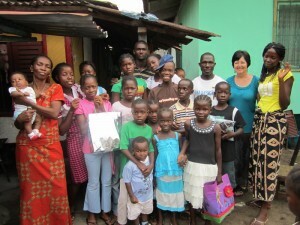 MA ESTHER’S HOPE HOME now has 16 beautiful children. What a great time we had with them at the party! They entertained us with drama and song. We had party horns and candy, popcorn and drinks. They absolutely loved the gifts, letters and photos that many of you sent. It takes so little to warm the heart of a child! So little! 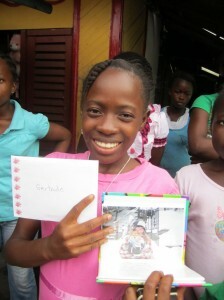 GERTRUDE shows off her letter & photos! 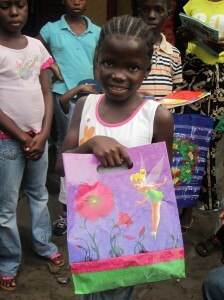 Eletha proudly holds her gift bag! In February Ma Esther took us to see the land we are purchasing to begin the building of a new house for her and these precious children. 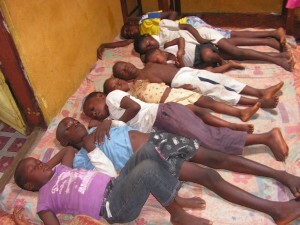 Right now they are overcrowed in a very small 3 room house. Everyone sleeps in a row on the floor. Coming up on May 6th in Mitchell, Manitoba there is a Fundraiser Dinner called “Raise the Roof” Gr. 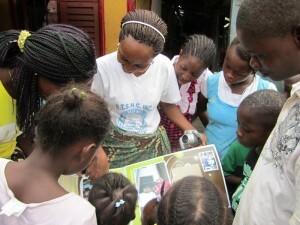 3 teacher Elaine Peters, and other Provision of Hope supporters are hoping to raise the funds needed for this project. The building site is in a quiet community near a good school. We are buying several lots so we can grow crops and do some gardening to help sustain these children. If you are interested to help with this project click here http://www.provisionofhope.comdonate.htm We are seeing so much growth and development in these children. Ma Esther you are a wonderful mother! If you would like more info on this project or tickets for the fundraiser email karen@provisionofhope.com Cost is 10.00 It will be a fun time!! We’ve just attended the Fundraiser for Ma Esther’s house…and what an amazing night it has been! 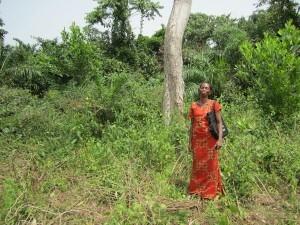 Ma Esther and her 16 children are getting their house! !